Christian communism can be seen as a radical form of Christian socialism. Christian communists may or may not agree with various parts of Marxism. They do not agree with the atheist and antireligious views held by secular Marxists, but do agree with many of the economic and existential aspects of Marxist theory, such as the idea that capitalism exploits the working class by extracting surplus value from the workers in the form of profits and that wage-labor is a tool of human alienation that promotes arbitrary and unjust authority. Christian communism, like Marxism, also holds that capitalism encourages the negative aspects of human nature, supplanting values such as mercy, kindness, justice and compassion in favor of greed, selfishness and blind ambition. Christian communists also share some of the political goals of Marxists, for example replacing capitalism with socialism, which should in turn be followed by communism at a later point in the future. However, Christian communists sometimes disagree with Marxists (and particularly with Leninists) on the way a socialist or communist society should be organized. In general, Christian communism evolved independently of Marxism, and most Christian communists share the conclusions but not the underlying premises of Marxist communists. Christian Communists have adapted many of Karl Marx's social and economic ideologies to their system of communism.This includes belief of capitalism exploiting the working class. They do not agree with his atheistic views. Thomas J. Hagerty was a Catholic priest from New Mexico, USA, and one of the founding members of the Industrial Workers of the World (IWW). Haggerty is credited with authoring the IWW Preamble, assisting in writing the Industrial Union Manifesto and drawing up the first chart of industrial organization. He became a Marxist before his ordination in 1892 and was later influenced by anarcho-syndicalism. Haggerty's formal association with the church ended when he was suspended by his archbishop for urging miners in Colorado to revolt during his tour of mining camps in 1903. Ernst Bloch (1885–1977) was a German Marxist philosopher and atheist theologian. Although not a Christian himself, he is said to have "bridged the gap" between Christian communism and the Leninist branch of Marxism. One of Bloch's major works, the Principle of Hope, contains such declarations as: "Ubi Lenin, ibi Jerusalem" [Where Lenin is, there is Jerusalem] and "the Bolshevist fulfillment of Communism [is part of] the age-old fight for God." Diane Drufenbrock was a Franciscan nun and Socialist Party USA member. She was the Vice-Presidential candidate for the Socialist Party USA in the United States presidential election, 1980. She worked as a teacher in Milwaukee, Wisconsin. Camilo Torres Restrepo was often considered to be a Christian Communist due to his attempts, as a priest, to reconcile Roman Catholicism with Marxism and the communist revolution. He was a key person for Liberation Theology, which was called Communist by both the Vatican and the US government. Christian communists hold the Biblical verse Acts 4:32-35 as evidence that the first Christians lived in a communist society. Acts 4:32-35 reads, "All the believers were one in heart and mind. No one claimed that any of their possessions was their own, but they shared everything they had. With great power the apostles continued to testify to the resurrection of the Lord Jesus Christ. And Gods grace was so powerfully at work in them all that there were no needy persons among them. For from time to time those who owned land or houses sold them, brought the money from the sales and put it at the apostles feet, and it was distributed to anyone who had need." Other biblical evidence of anti-capitalistic belief systems include Matthew 6:24, "No one can serve two masters.Either you will hate the one and love the other or you will be devoted to the one and despise the other.You cannot serve both God and money." Also, "each according to his abilities" has Biblical origins too. Act 11:29 states: "29 Then the disciples, every man according to his ability, determined to send relief unto the brethren which dwelt in Judaea." And "To each according to his needs" is Biblical, too. Acts 4:35 "to the emissaries to distribute to each according to his need." Thomas Wharton Collens' Preaching describes biblical sources supporting a common-property society. The hammer from the hammer and sickle is replaced by a Latin cross. 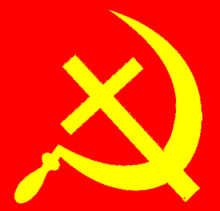 Christian Communist symbolism is basically the same as its secular cousin, although there have been unofficial symbols which accurately show the connection between Christianity and Communism. Hammer, Sickle, and Cross – This symbol is the most identified with Christian Communism of all other symbols. 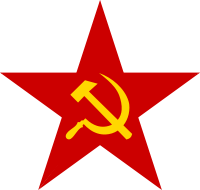 It shows a standard Hammer and Sickle with a diagonal bar through the hammer's grip, thus forming a cross shape. Red Ichthys – This symbol is gaining popularity, though is not as popular as the above symbol. It shows an Ichthys in the middle of a red flag, a symbol commonly used in Communism. Red Chi-Rho – This symbol is basically identical to the Red Ichthys, however it has a Chi-Rho in a red field, rather than an Ichthys. A number of Christians, of various political persuasions, object to the use of the word communism in the term "Christian communism" due to that word's association with the governments of nations such as the Soviet Union, Cuba, China, Vietnam, and North Korea, which are not seen as neutral. Many of the policies adopted by the governments of those countries were inarguably un-Christian in character, including official state hostility towards religious institutions. As such, many Christians argue that the title of Christian communalism should be used, rather than Christian communism. On the other hand, some Christian communists believe that it is necessary to employ the word communism in order to capture the essence of their position on economics. They point out the existence of significant communist opposition to the totalitarian "communist states" of the 20th century (including, for example, Trotskyism), and argue that, if they were to abandon the term communism, it would only serve to further obscure the history of that opposition. Thus, these Christian communists hold that the term 'Christian communism' is accurate and appropriate, as long as it is specified that they belong to the democratic, anti-Stalinist branch of communism. Contemporary communism, including contemporary Christian communism, owes much to Marxist thought – particularly Marxist economics. Not all communists are in full agreement with Marxism, but it is difficult to find any communists today who do not agree at least with the Marxist critique of capitalism. Marxism, however, includes a complex array of views that cover several different fields of human knowledge, and one may easily distinguish between Marxist philosophy, Marxist sociology and Marxist economics. Marxist sociology and Marxist economics have no connection to religious issues and make no assertions about such things. Marxist philosophy, on the other hand, is famously atheistic, although some Marxist scholars, both Christian and non-Christian, have insisted that Marxist philosophy and the philosophy of Marx and Engels are significantly different from one another and that this difference needs recognition. Jose Porfirio Miranda, in particular, found Marx and Engels to be consistently opposed to deterministic materialism and broadly sympathetic towards Christianity and towards the text of the Bible, although disbelieving in a supernatural deity. However, Lenin, the leader of the Marxist Russian Revolution did allow Christians in his party. There is also the question of how a communist society should be actually achieved. While orthodox communists advocate a form of violent revolution, Christian communists almost universally insist on nonviolent means, such as passive resistance or winning elections. Regarding the issue of the nationalization of the means of production, which is seen by some Christians as theft, Christian communists argue that capitalism itself is a form of institutionalized theft in the manner that capitalist owners exploit their workers by not paying them the full value of their labor. Not all Christian communists seek to achieve large-scale social change, however. Some believe that, rather than attempting to transform the politics and economics of an entire country, Christians should instead establish communism at a local or regional level only. The Latin American branch of Christian Communist Liberation Theology, according to theologians such as Leonardo Boff; is rooted in the concept that "prudence is the understanding of situations of radical crisis". Among Christian Communists, Historical Materialism is utilised as a methodology of analysis to define the nature of the crisis in question as a product of political-economic dynamics and modalities derived from the workings of what is termed "the late capitalist/imperialist mode of production". According to this subset of Liberation Theology, the challenge for the Christian Communist is then to define what it means (in context of "a concrete analysis of the concrete social reality"), to affirm a "preferential option for the poor and oppressed" as Praxis (active theory), and as commanded by an ethics allegedly "rooted in the beatidic teachings of Jesus". Christian Communist Liberation Theology is not about evangelization per se, but rather about developing an Orthopraxis (ethical action; The condition of coming to the light by doing the works of God), that aims to reconcile the "Beatidic Ethics" of Jesus, as expoused in the Sermon on the Mount; with existing social struggles against what is termed "neo-colonialism" or "Late Capitalism". Both Christian Communism and Liberation Theology stress "orthopraxis" over "orthodoxy". A narrative of the nature of contemporary social struggles is developed via "materialist analysis" utilising historiographic concepts developed by Karl Marx. A concrete example are the Paraguayan Sin Tierra (landless) movement, who engage in direct land seizures and the establishment of socialized agricultural cooperative production in asentamientos. The contemporary Paraguayan Sin Tierra operate in a very similar manner as that of the reformation era Diggers. For Camilo Torres (the founder of the Colombian guerrilla group E.L.N. ), developing this Orthopraxis meant celebrating the Catholic Eucharist only among those engaged in armed struggle against the army of the Colombian state, while fighting alongside them. ↑ "Acts204:32-35 NIV - - Bible Gateway". www.biblegateway.com. Retrieved 2016-05-18. ↑ "Matthew 63A24 NIV - - Bible Gateway". www.biblegateway.com. Retrieved 2016-05-18. ↑ "Jesús, un hombre de equilibrio, fantasía cradora y originalidad##Leonardo Boff, teólogo". Redes Cristianas. 2009-06-20. Retrieved 2011-12-29. ↑ Praxis. "The Praxis Group". Marxists.org. Retrieved 2011-12-29. ↑ Archived March 6, 2010, at the Wayback Machine. ↑ "MCP (Movimiento Campesino Paraguayo)". Okaraygua-paraguai.org. Retrieved 2011-12-29. ↑ Sutherland, Donald R. "The Religion of Gerrard Winstanley and Digger Communism". Retrieved 2011-12-29. ↑ "Rexroth". Diggers. 2011-11-26. Retrieved 2011-12-29. ↑ "Bienvenido/a a nuestra página Web – Ejército de Liberación Nacional". Eln-voces.com. 2008-05-26. Retrieved 2011-12-29. ↑ "Colombia rebel groups Farc and ELN agree 'to unite'". BBC News. 2009-12-17. Retrieved 2011-12-29. ↑ McDermott, Jeremy (2009-11-05). "Colombia's ELN rebels show new vigour". BBC News. Retrieved 2011-12-29. ↑ "Camilo Torres Restrepo 1929–1966". Filosofia.org. Retrieved 2011-12-29.